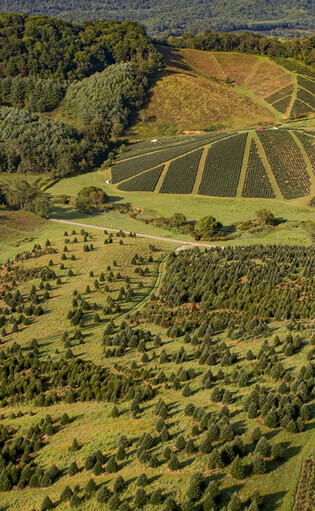 Christmas trees are biodegradable and can easily be reused or recycled for other purposes including mulch, soil erosion barriers, fish feeders, bird feeders, or paths for hiking trails. So once the holidays are over, don’t throw your tree out. Recycle it! Many providers will collect trees during regular pickup schedules for the two weeks following Christmas. There are often requirements for size, removing ornaments, flocking, etc. Take your tree to a drop-off recycling center. Most counties have free drop-off locations. Usually, you may take up to two trees to a drop-off location at no charge. Cut your tree up and put it in your yard waster container. Tree recycling and mulching programs are a fast-growing trend in communities throughout the nation. Check with your local department of public works for information. They chip and shred the trees, then make the mulch available for use in your garden. Your hauler will notify you of pick-up dates in your area. Be sure to check with your local hauler. Call for an appointment to have a nonprofit organization in your area pickup your tree. Some Boy Scout troops offer a pickup service for a small donation (often $5). Consider starting a tree recycling program near you. For more information about tree recycling, visit the National Christmas Tree Association or Earth911. The best way to avoid a mess removing your tree is to place a plastic tree bag (available at hardware stores or Christmas tree retailers) underneath the stand when you set the tree up. You can hide it with a tree skirt. Then, when the holidays are done, pull the bag up around the tree, stand and all, and carry it outside. Obviously, you will want to remove the stand before recycling the tree. If some needles do scatter inside, it is better to sweep them up; needles can clog vacuum cleaners.